It’s not officially fall yet. But as the leaves on street are definitely turning yellow, the temperatures are ACTUALLY dropping this weekend and you can taste a little warm, earthy notes pumpkin spice in the air, you’ll want to get in the fall spirit. Right ? And where better to do that than a pumpkin spiced kitchen. 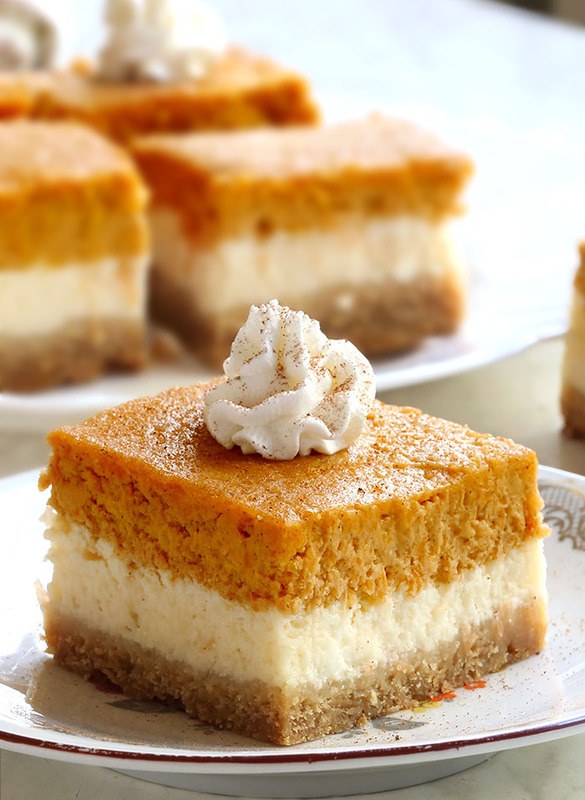 Most of You know I love pumpkin & cheesecake, and that I already have a recipe for both Pumpkin Pie cheesecake and New York cheesecake, but now I’m putting them together into these Pumpkin Pie Cheesecake Bars. They’re everything you love about spiced pumpkin pie and tangy cheesecake, just packed into one sweet dessert. 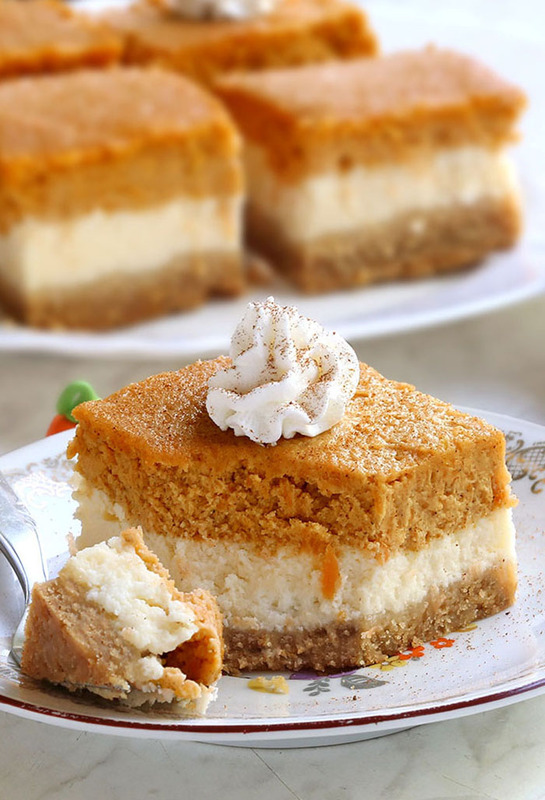 While two layers of cheesecake may seem complicated, all you have to do is make one batch of filling, put half of it on the crust, then add pumpkin and spices to the remaining filling. 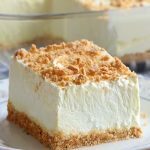 To make the cheesecake filling smooth and silky, it is important to have both eggs and cream cheese at room temperature. You also have to keep in mind to not over-mix filling, otherwise you’ll most likely end up with cracks. I decided that I’d use my favorite graham cracker crust (you can reach for gingersnap or flaky pie crust instead). Start by crushing your graham crackers. You need 10 graham crackers. (10 full sheets = about 1 and 1/2 cups graham cracker crumbs). Mix the crushed graham crackers with 6 Tablespoons of melted butter. Does your graham cracker crust always fall apart? There probably isn’t enough butter to hold the crumbs together. I like to use a good amount of butter in my graham cracker crust for flavor, but more importantly, butter is the binding agent here. The crust needs to be tight and compact, which is especially important if you’re using this crust for a no-bake pie. The trick to a really great graham cracker crust is to pack it down. I like to use a flat bottomed small measuring cup to help pack it down and smooth out the surface. 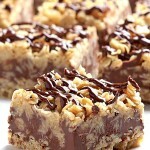 If you’re making a no-bake dessert: chill the crust for at least 2 hours before filling it. Chilling the crust ensuring a compact crust. If you’re making a baked dessert: pre-bake this crust for 10 minutes at 325°F or 7-8 minutes at 350°F. 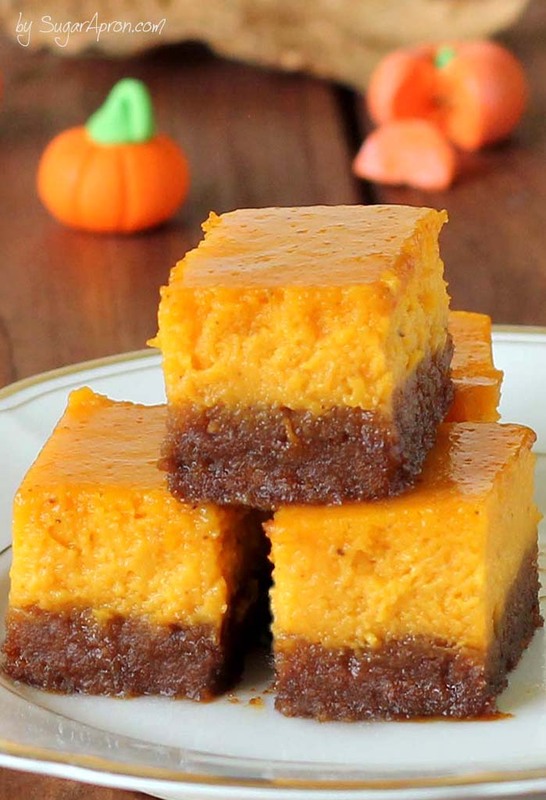 These Pumpkin Pie Cheesecake Bars are a great make-ahead dessert because the bars need time to both cool and chill, so it’s best made the day ahead. Pumpkin Pie Cheesecake Bars are everything you love about spiced pumpkin pie and tangy cheesecake, just packed into one sweet dessert. And let me tell you.....they’re absolutely delicious!! In a small bowl, combine graham cracker crumbs and melted butter. Press onto the bottom of a 9x13-inch baking dish coated with cooking spray. Bake at 325° for 10-12 minutes or until set. Cool on a wire rack. In a large bowl, beat the cream cheese until smooth. Beat in eggs, one at a time, just until blended. Add the sugar and vanilla, beat on low speed until mixture is smooth. 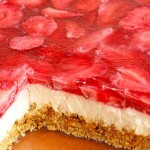 Spread half of the cheesecake batter into the cooled baking dish, smoothing the top, and set aside. Add the pumpkin purée and pumpkin pie spice to the remaining filling and whisk until smooth and combined. 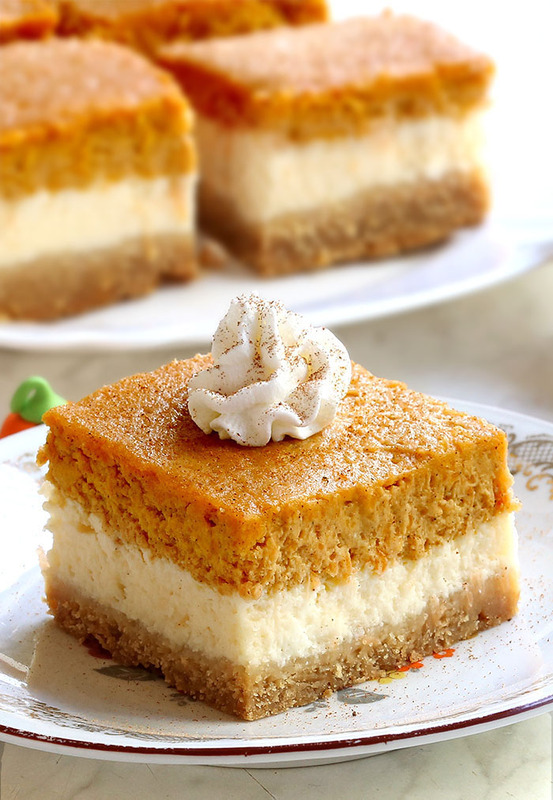 Carefully spread pumpkin mixture over plain cheesecake mixture into an even layer. Bake at 325° until the edges are set but the center still jiggles slightly, 40 to 50 minutes. Place the dish on a wire rack and cool completely, 2 to 3 hours. Cover with aluminum foil and refrigerate at least 3 hours or overnight. 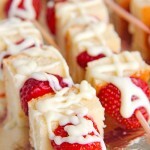 Cut into bars, garnish with whipped cream and pumpkin pie spice if desired. 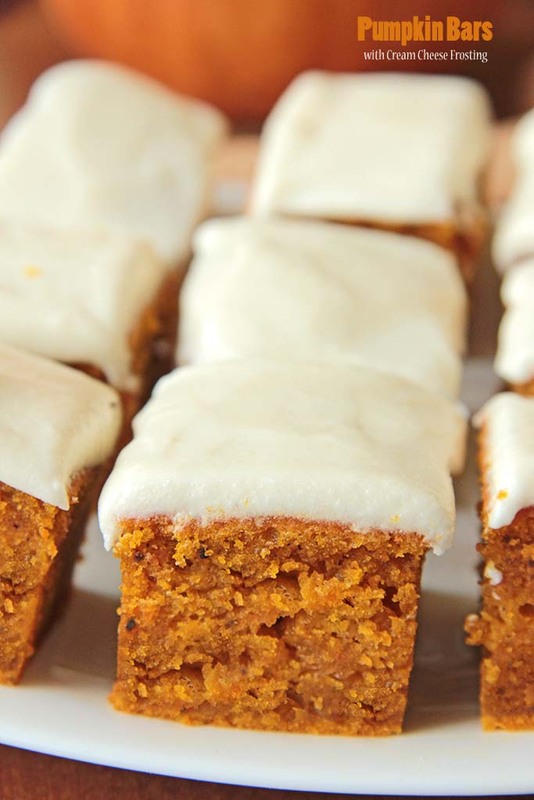 Craving more Pumpkin Recipes ? Instead of pumpkin pie this season, try this gingersnap pumpkin pie bites.